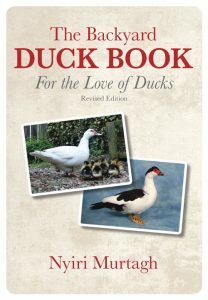 A revised edition of Nyiri Murtagh’s popular book, For the Love of Ducks, but with colour photographs of the duck breeds. It covers all aspects of duck husbandry, from selecting a breed and buying ducks to housing, breeding, feeding and health. It includes a description of each of the duck breeds currently available in Australia, the standards for each breed, their egg laying capacity and their potential as table birds. The book also has a comprehensive section on artificial incubation of eggs that includes step by step instructions on how to test eggs for fertility and defects. Crossbreeding, developing your own lines and raising ducks for meat are also covered. Backyard poultry farmers, small-acre farmers and hobby farmers will find this book an enjoyable and useful reference. Nyiri Murtagh was raised in a semi-rural environment where there was always a chook, duck or peacock wandering past the front door. When he discovered the wonderful world of waterfowl in the 1980s books on waterfowl were pretty much the same as they are now, hard to get, and when Nyiri did find some, they never answered his questions. So he began going to shows, purely as an observer, and spending all his free time watching his birds. It wasn’t long before he was travelling all around Australia, purchasing ducks and geese to add to his collection.